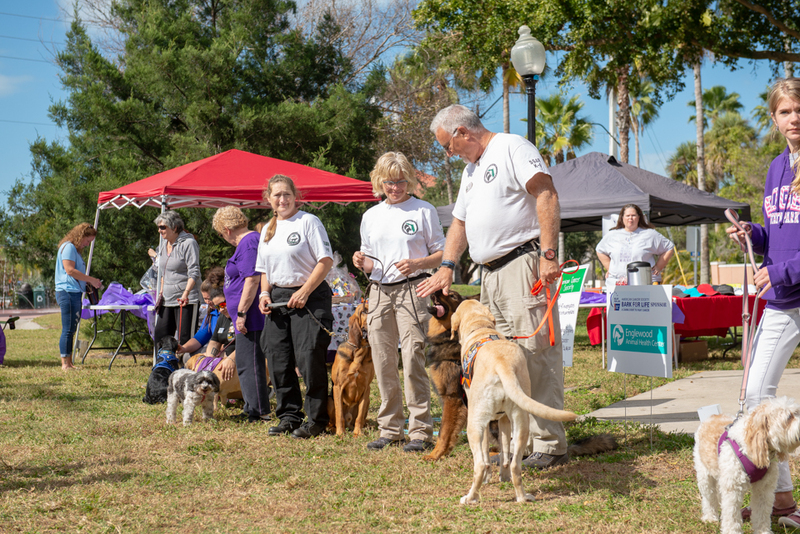 Over the weekend I was one of the vendors at the Bark for Life. Not only did I have a table with a display of my work, for a donation I also take photos of the dogs and/or their families who walk for the Bark for Life. Founded to raise awareness for cancer in both canines and their human friends, this is a cause that's near and dear to my heart having lost my first dog, Mika, to hemangiosarcoma (a cancer of the blood) a few years ago. We had the picture perfect September day for this event. With the sun popping in and out of the clouds, it was the optimal condition for a photographer! I captured lots of head tilts on the bridge at the Pennsylvania Military Museum. While there was a smaller crowd participating, there were more vendors than in previous years. Hopefully next year, there will be a bigger turnout. It's a great way to spend an afternoon with your pooch and help a wonderful charity! Calling all dogs! I'll be at the Bark for Life this Sunday at the Boalsburg Military Museum from 1 - 3 pm. This is a great cause bringing awareness to our canine friends who have fought cancer or have played a role in helping their owners fight this awful disease. Come on out and say "Hi!". It's going to be a glorious day, so what more reason do you need to spend an afternoon with your pooch? I've been a part of this event for a few years and am so excited to be back again! For a donation you can have your photo taken with your furry friends - all proceeds benefit Bark for Life! Labor Day traditionally marks the end of summer when public pools close for the year. However, many towns are leaving them open for one last swim - that's gone to the dogs. Literally! For a few hours of fun, pooches of all shapes and sizes can enjoy one last afternoon of summertime fun. This year, Centre Region Parks and Recreation changed things up a bit. Since the event had grown so much, they broke down the time into two groups - small dog and big dog play time. I think this a great decision since so many small dogs were intimidated by the big dogs. But it sure was like day and night! Not many small dogs attended, and most of them were happier running around chasing one another. By contrast, within minutes of opening the pool to the big dogs, Park Forest Pool had turned into Retriever City! Goldens and labradors of all ages as well as several other breeds came out and the pool was full of happy go lucky tennis ball loving canines! I'm not really sure who had more fun - the pooches or their owners. But it was clear that watching our furry friends have so much fun brought smiles and laughter all around! If you've never attended, then this is something you need to put on your bucket list for next summer! I've been to every event since it started four years ago. Each year my golden retriever Izzy gets a little braver. The first year I couldn't get her in the water. The second year she went in as long as I was by her side. Last year, once I got her in, I couldn't keep her out. This year she went in for one quick swim, but only after she hung out along the edge and took all the tennis balls out of the pool first! Don't ask me why, she never cleans up her toys at home! Here's a few happy canines! We're only days into the New Year, but I'm off to a busy start! With less than a week to go until our extended trip to Florida, I've been busy wrapping up year end paperwork, packing for our time in the sunshine state and getting ready for some awesome pet events happening as soon as I arrive! First up, I'll be one of the vendors at Pets on Third which takes place on third street south in Naples, FL, Sunday Jan 15 from 10 am - 2 pm. I'm so excited! My husband Steve was there for last year's event and he told me I would have a blast! Dogs are invited, in fact, they are encouraged to come and bring their owners! Every year there is a pet parade where dogs and their owners dress up according to a theme. This year it is Pets on the Red Carpet: Night at the Oscars. Prizes are awarded in a variety of categories. Food and drinks for pets and people are available. Proceeds benefit the Naples Dog Park. So if you're in the southwest Florida area, I'll hope you'll stop by and see me!